1449600816 -The foundation for EMS education was established in 1971 when the American Academy of Orthopaedic Surgeons (AAOS) authored the first emergency medical technician textbook. Since then, the AAOS has set the gold standard for EMS training programs with the Orange Book Series. This Second Edition, based on Intermediate Emergency Care and Transportation of the Sick and Injured, raises the bar even higher with world-class medical content and innovative instructional resources that meet the diverse needs of today’s educators and students. Based on the new National EMS Education Standards for Advanced Emergency Medical Technician, the Second Edition offers complete coverage of every competency statement with clarity and precision in a concise format that ensures student comprehension and encourages critical thinking. New cognitive and didactic material is presented, along with new skills and features, to create an innovative AEMT training solution. Topics including advanced pathophysiology, acid-base balance, fluids and electrolytes, intravenous therapy, intraosseous access, blood glucose monitoring, and administration of AEMT-level medications tailor this textbook to the new Advanced EMT level. Additional online skills allow this textbook to be customized for every AEMT training program’s unique needs. 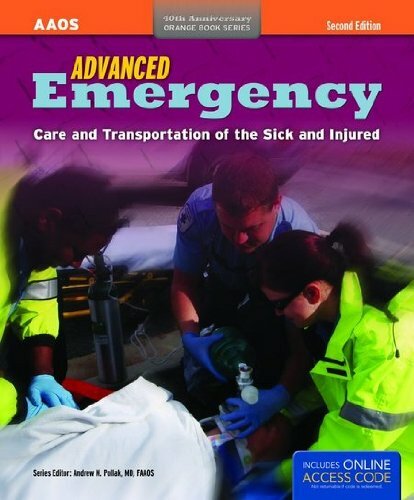 Advanced Emergency Care and Transportation of the Sick and Injured, Second Edition incorporates up-to-date, evidence-based medical concepts to ensure that students are taught assessment and treatment modalities that will help patients in the field today. Advanced Emergency Care and Transportation of the Sick and Injured, Second Edition provides a solid foundation in pathophysiology–one of the key knowledge areas required to become a successful Advanced EMT. This Second Edition teaches and reinforces the concept of Patient Assessment with a single, comprehensive chapter, ensuring that students understand patient assessment as a single, integrated process–the way that providers actually practice it in the field. Each medical and trauma chapter reinforces the patient assessment process by highlighting the unique aspects of the illness or injury. Through evolving patient case studies in each chapter, the Second Edition offers students a genuine context for the application of the knowledge presented in the chapter. This approach makes it clear how all of the information will be used to help patients in the field.